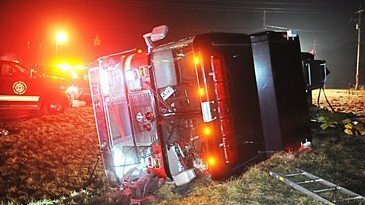 Two fire responders were taken to the hospital Sunday night with minor injuries after their fire truck landed on its side on Route 235 and Gerlaugh Road, according to Bethel Twp. Fire Chief Jacob King. The two responders were not on an emergency run when the incident happened and no other vehicles were involved. Crews reported a loss of brakes and were unable to control the truck as they were making a sharp right turn onto Route 235 from Gerlaugh Road, said King. They then lost control and the truck flipped onto its side and slide across the road. Both responders will be okay but were taken to Springfield Regional Medical Center for evaluation.